A Web-Based Introduction to Programming is designed for use in introductory programming, programming logic and design, or Web programming courses, and for anyone seeking a painless way to learn the basics of programming by developing small Web applications. The book is clearly written, using consistent examples in every chapter and step-by-step descriptions of standard programming procedures. Each chapter follows precise learning outcomes that are accurately tested by the end-of-chapter quizzes and exercises. 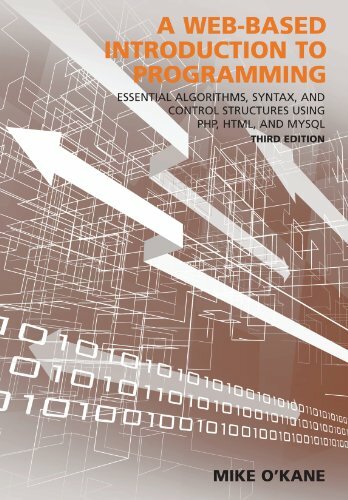 A Web-Based Introduction to Programming keeps the focus on the need for beginning programmers to learn essential syntax and control structures with minimal complexity. Each chapter focuses on a single topic and related material is provided in appendices. Students learn to convert requirements into algorithms, and then develop small Web-based applications using a combination of PHP and HTML. The chapter code exercises are designed to improve skill and confidence step-by-step: fixit exercises provide small programs that include a single error of some kind and help students develop their problem-solving abilities and debugging skills; modify exercises provide working programs that must be modified to perform a somewhat different or additional function (these exercises test students' ability to read, understand, and adapt existing code); code completion exercises allow students to apply all concepts and tools covered in the chapter by developing new applications; and all required software is provided and can be installed quickly and easily in minutes under Windows, Macintosh OS X or Linux. The software can be installed entirely on a USB drive so that students can carry their complete work environment with them (no need for special classroom installation). If you have any questions about this product by Carolina Academic Press, contact us by completing and submitting the form below. If you are looking for a specif part number, please include it with your message.